No more waiting in traffic or hiking across icy lots - the slopes are just steps away. Avoid long lines in the village thanks to a ski rental shop on the ground floor. Get in a few laps or take a leisurely swim - the outdoor pool is heated year round. Unwind after an adventure-filled day on the mountain at the posh indoor hot tub. Open up the door to your private balcony to let in some of that fresh mountain air. 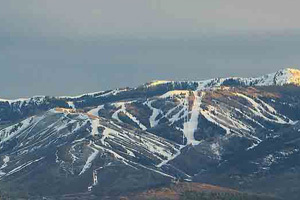 Hit the slopes at Park City Mountain Resort. Crescent High Speed Quad or Playday Hi-Speed Six Pack lifts are only a 2 minute walk from the resort. You're just a 3 minute drive from all the excitement of downtown Park City. The brand-new indoor hot tub is the perfect place to unwind after a long day on the slopes. Get your snacks ready and challenge your family to a hike. Round Valley Trailhead is a 9 minute drive from the resort. Brag about your score at Park City Golf Course, a 5 minute drive from the resort. Get ready for an epic family ski trip in one of the country’s top destinations, without the hefty price tag. Voted Best Value by Stay Park City, the Shadow Ridge Resort Hotel boasts the comforts of home, the amenities of a hotel, and a totally rad slopeside locale. Park your car in the complimentary garage and leave it there – the lifts at the Park City Base are less than a 100 yards away, along with the various shops and dining that come with a ski village. The onsite Utah Ski & Golf rental shop right in the lobby provides the utmost in convenience (plus a sweet discount for Shadow Ridge guests). Once the friendly ski technicians have your crew fully equipped for the powder day ahead, just waltz on out to the slopes. With two base villages, 7,300 rideable acres, and a six-mile wide mountain it’s no wonder that Park City Mountain Resort is one of the most-visited ski destinations in the Western Hemisphere. Hop the First Time Lift to warm up with a leisurely green run, or head to the 3 Kings Lift and try some blues. Traveling with a little one? Hop the free town shuttle to Canyons Village and drop your tot at the Little Adventures Children’s Center, a licensed daycare that looks after tykes 6 months to 6 years old and provides plenty of fun activities – even a gondola ride! After an adventure-filled day hitting the slopes hook back up with the crew and head back to Shadow Ridge for a soak ‘n steam at the newly-refurbished indoor hot tub and sauna. One- and two-bedroom condo suites are airy and inviting, individually decorated with elegant furnishings and tasteful décor. A full kitchen (and the nearby Fresh Market grocery store) makes home-cooking a breeze, so whip up whatever you’re craving and sit down to a family meal at the dining table. Comfy couches, cable TV and a cozy wood-burning fireplace makes the living area prime for downtime with the crew. No more waiting in line for a shower thanks to multiple bathrooms in every condo. Park City has more to offer than choice skiing! Take a break from the slopes with merrymaking activities like ice-skating, snowshoeing, sleigh rides, or the always popular Alpine Coaster. A bit snowed out? Historic Main Street is just a half-mile away from the resort. Take a leisurely stroll into town, or hail Shadow Ridge’s complimentary on-demand shuttle to whisk you away. Peruse the quaint shops and Victorian architecture until the stomachs start rumbling. Then pick from a vast array of eateries, from specialty rolls at Yuki Yama Sushi to wild game at Riverhorse on Main. - Front desk is open 9:00 AM-5:00 PM during off-season and 24 hours during peak-season (winter months). Guests that are planning to arrive after hours may check in using the after-hours lockbox located adjacent to the front desk. A phone number is provided on the lockbox to obtain the access code. For more details please contact the property using information on the booking confirmation.